Turf.js has become an indispensible part of my Node.js workflow over the last couple years. Turf brings an unparalleled level of sophistication to geospatial data, I haven't seen any library in any other language that makes working with GeoJSON quite as easy. Turf and Node.js also work nicely with MongoDB, so you can leverage MongoDB to handle GeoJSON data that's too big to fit in memory and then do additional processing in Node.js with Turf. Much like how numpy and scipy made Python a go-to language for number crunching, I think Turf makes Node.js the go-to for geospatial. Geospatial is hard, and even massive companies whose businesses are built on geospatial data don't always do it well, like Uber. Below is Uber's polygon describing what parts of the San Francisco Bay Area are not eligible for flat fare rides. Clearly a candidate for a MultiPolygon but odds are some part of Uber's stack doesn't support it. Which Points are Within a Polygon? GeoJSON has several fundamental data structures, but this article will only consider features, points, lines, and polygons. A point is a single latitude and longitude coordinate pair that represents a single point on the Earth. An example GeoJSON point is shown below. A polygon is a list of points defining a shape on a map. 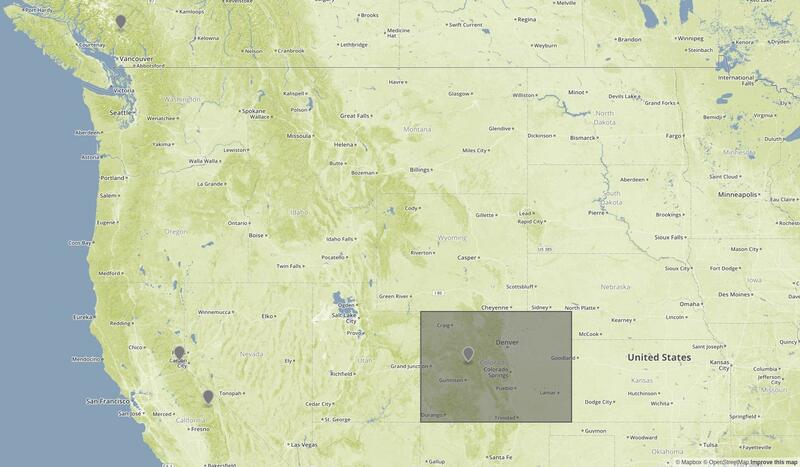 Below is a sample GeoJSON polygon that approximately represents the US state of Colorado. A line is a list of coordinates representing a line on the map. For example, below is a GeoJSON line that represents the boundary of the Colorado polygon above. A feature is a wrapper object that contains a point, line or polygon in its geometry property. Below is a feature that wraps the above polygon. Generally, Turf prefers to use features rather than points or polygons. The @turf/helpers npm package contains helpers for creating point and polygon features. Below is an example of creating a polygon feature representing the state of Colorado and 4 point features representing North American ski destinations. // Note the triple-nested array. // Approximate coordinates of 4 ski destinations in North America. Here's how these features look on a map. Click on the map for an interactive view. How do you determine which of these points is within the polygon? You can use the @turf/inside npm package, which returns true if the given point is within the polygon, and filter() over an array of the 4 points. Determining whether a point is within a polygon is one of the most common geospatial computing tasks. For example, the gross Uber polygon in the introduction is used to determine whether a point (your current position) is within an area that isn't eligible for flat fares (the polygon that contains the major Bay Area airports). Another common geospatial computing task is determining the distance between two points, or, more generally, ordering points based on their distance from a point. The @turf/distance npm package computes the distance between two points. Here's how you use Turf's distance() function to sort the 4 ski destinations based on their distance from San Francisco. Checking if a point is in a polygon and finding the distance between two points are both fairly simple. Let's do something more sophisticated: what's the distance between a polygon and a point outside the polygon? For example, with the above data set, how far is Mammoth Lakes from the border of Colorado? Turf makes Node.js a natural choice for working with GeoJSON. The above use cases are just the tip of the iceberg of what Turf offers. Writing your own logic to calculate the distance between two points isn't too hard, but Turf can do some very complex calculations for you, like convex hulls, line intersection, Voronoi diagrams, and areas. The Turf team is adding new functionality regularly: I previously implemented DBSCAN clustering on top of Turf for an internal project, and they've since added their own implementation. Check out Turf if you find yourself dealing with geospatial data, it will enable you to do some incredible things with geospatial data.